Decked out with flashy pop culture prints and ostentatious black and gold decor, Bisha is all about in-your-face extravagance. Bisha is all about in-your-face extravagance. In the lobby, glitzy gold details offset black walls with crushed velvet features. The gleaming gold reception desk shines like a beacon ushering you to check-in while an art installation soars overhead. The moody, yet flashy theme resonates throughout Bisha giving it a boutique-y feel that’s ostentatious in its eccentricity. 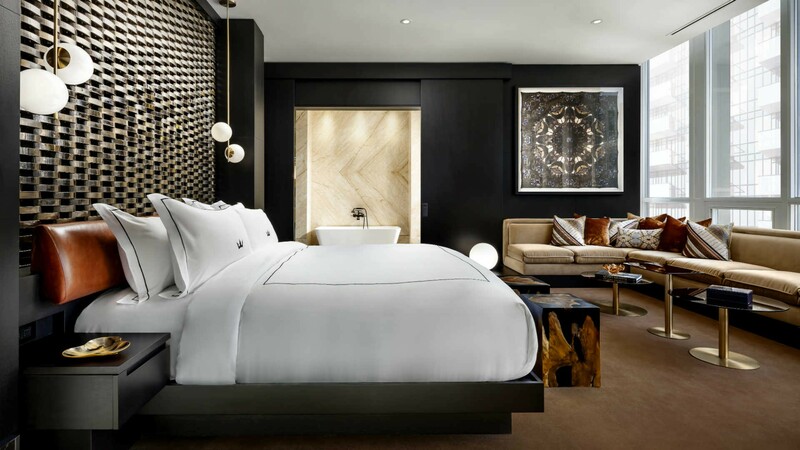 Decked out in flashy prints of pop culture icons and photos of models, each of Bisha’s rooms is slightly different than the last – but just as glitzy. A swirling geometric carpet, custom made furniture, crushed velvet and other textiles can be found throughout while floor to ceiling windows and white walls brighten up the busy space. The dazzling marble bathrooms in every room come equipped with heated floors for maximum comfort and are outfitted with luxurious Byredo amenities. After having experienced Bisha’s bright rooms with art-lined walls, stepping onto the Kravitz Design Floor is akin to falling down the rabbit hole. The same luxurious features are the only common thread between these two very different worlds. The Kravitz rooms are cloaked with black walls and dark patterns. The cool blue, grey and purple hues found in the rest of the hotel’s accommodations have been replaced with warm browns and oranges with splashes of metallic gold. It’s the ideal place to cocoon away from the world and nurse a hangover or recover from a long night of being a rockstar – à la Lenny Kravitz. Rooms on this floor range from the 400-square foot Yves room to the 2,000-square foot, two-storey Bisha Suite – with living room, dining area, kitchen and sprawling outdoor terrace. Behind thick, velvety curtains, lobby lounge, Mister C Bar Room provides a lavish atmosphere for imbibing. 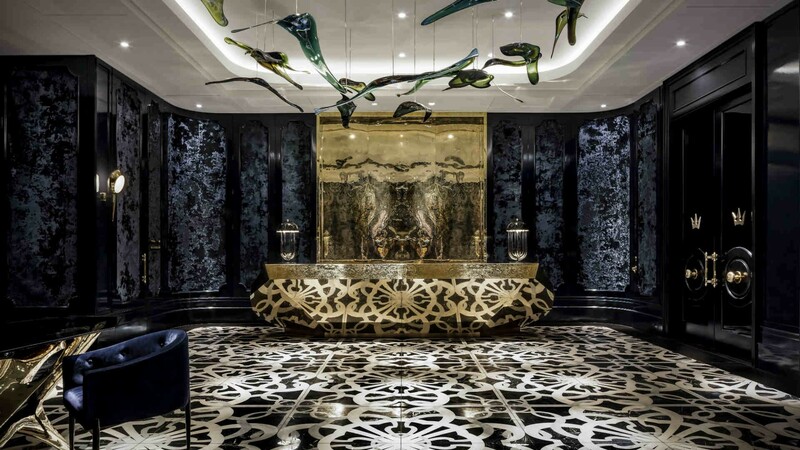 The dark walls are accented with gold and marble trimmings and framed Alexander McQueen scarves. On the other side of the lobby, Paris inspired café, French Made offers coffee and baked goods. Accessible directly from the hotel is Akira Back, the first Canadian installment of the dining hotspot, which continues Bisha’s theme of ostentatious black and gold. Specializing in Korean-Japanese fare, the menu features familiar maki rolls, sushi and sashimi along with share plates like wagyu tacos, grilled Alaskan king crab and sea urchin tempura. 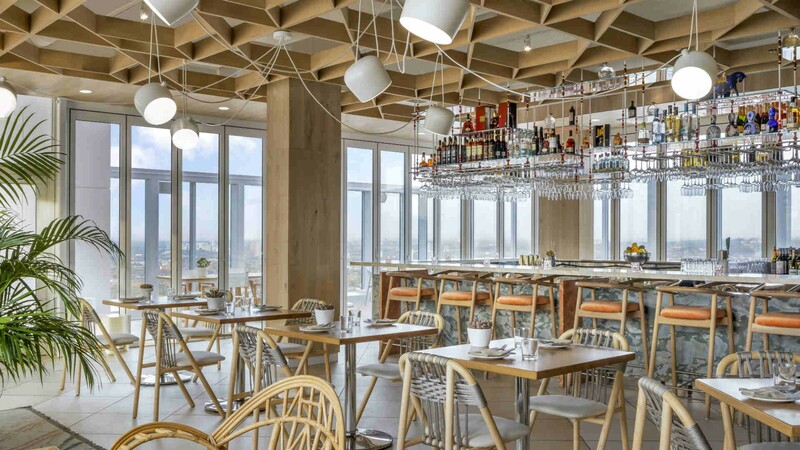 Head up to Bisha’s 44th floor for California vibes and Baja inspired cuisine at Kost. Floor to ceiling windows provides a stunning view that seems to stretch all the way to Hamilton. During the summer months, the rooftop patio and shimmering infinity pool turn into an urban oasis complete with lounge chairs and palm fronds. 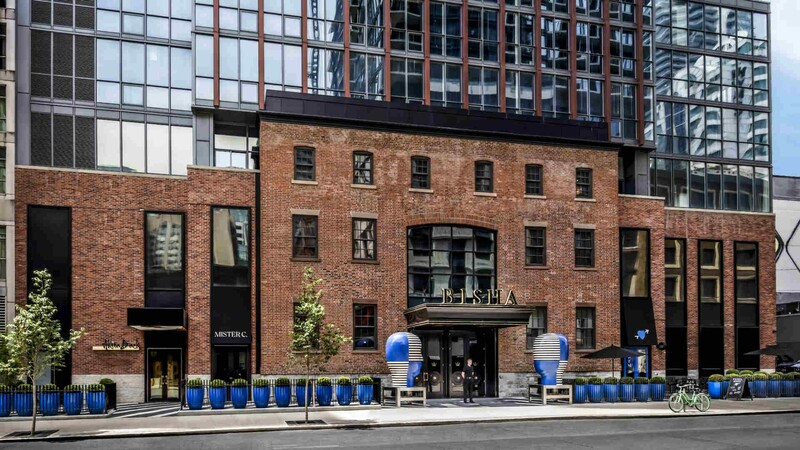 Just south of King Street, a block east of Spadina, Bisha is in a prime location to access some of Toronto’s best attractions. Easily access King West’s trendy eateries and exciting nightlife scene. 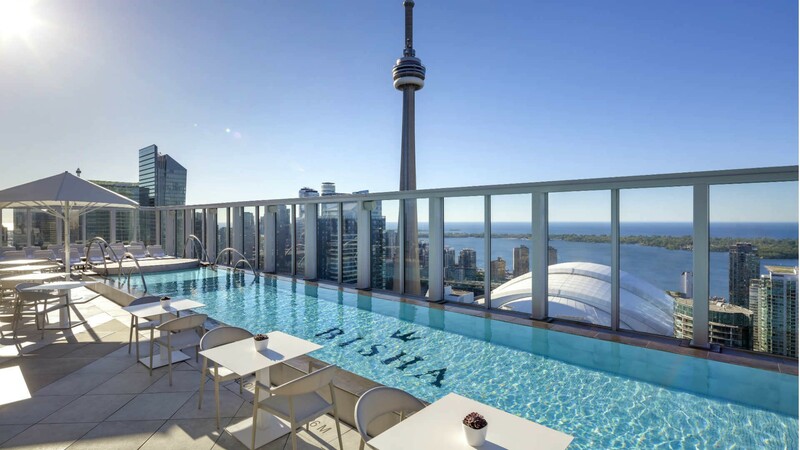 Walking distance from the Convention Centre, CN Tower, Ripley’s Aquarium, Scotia Bank Arena, the Rogers Centre and several theatres, this luxury hotel is the place to crash after your night out on the town.